Feature The emergence of the Internet of Things has analysts in a froth predicting that by 2020 homes will be awash with clever connected appliances. We’re not talking tablets and TVs here, but the brave new world of white goods, where manufacturers are battling it out to smarten up our cooking, cleaning and security systems. So how much is out there and what lies ahead? El Reg domestic goddess Jennifer Newton goes shopping for the home of the future. The smart revolution has come of age for a fully connected home and it’s not just the stuff of pastHanna-Barbera TV shows or futuristic movies. We have the smartphone to thank for the digitisation of domesticity as it delivers the interface and the communication, so all you need to do is add the internet to a thing and hope it does something useful – it's as simple as that. 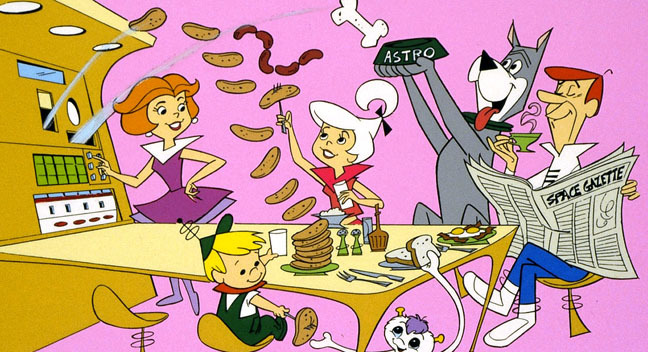 Meal times with The Jetsons – how did Jane manage without an app? It’s not all new, the affluent have, for some time, been able to kit out their homes with security systems that connect to, say, a TV to see who’s calling or prowling, but only recently have kitchen appliances and affordable home security systems been configured to become part of the Internet of Things (IoT). One growing example is that many UK households are already utilising IoT tech when it comes to remote-controlled heating. You can be anywhere and, from an app on your phone, you can determine what your heating and hot water should be up. Turn it off because you’re out late, turn it on early as it’s gone a bit chilly or set eco-friendly schedules for any time of day. While this is nice and cosy for energy suppliers and smart thermostat manufacturers, the makers of domestic appliances have their own IoT vision too. How about a home where turning on one device, will activate the whole lot? From the cooker to the TV, these devices are being enabled to connect and talk to each other. With Wi-Fi, Bluetooth Low Energy (BLE) and even Powerline, walls don’t need to be drilled nor cables laid either, which means that not only homeowners but renters too can have a 21st century smart home – just unplug and take the kit with you when you move. British Gas Hive app delivers reveals the home temperature remotely enables easy scheduling and can even respond to texts. Shame it hasn't got a one-hour boost on the heating yet, though. Globally, the appliance giants have embraced IoT, although for some time we’ve heard nothing but talk. Finally, we’re now seeing more convincing evidence that the backroom R&D work has given way to unveil new products to woo us with, and different platforms for connecting "things" are becoming established too. Consumers will ultimately decide which platform of products they prefer and some manufacturers may end up going the way of Betamax. That said, we’re already used to multiple platforms when it comes to smartphones in choosing Apple, Android, Windows or BlackBerry – why not with the Smart Home too? To be practical and realise a widespread take up of connected home appliances, the major industry players need to work together to ensure devices speak with each other regardless of brand. When it comes to integration, brand mixing would be the goal – why shouldn't Electrolux oven connect with the LG TV to notify you when the joint is ready? But in the white goods world, who’s uniting with whom to provide this level compatibility and, hopefully, simplicity? So the race is on, as Samsung, like its rivals, has talked the talk and can finally walk the walk with some domestic appliances to show off. It’s already possible for some white goods to connect via an app and smartphone remotely. For instance, LG’s F14U1TBS2 washing machine is already available in the high street for £550. 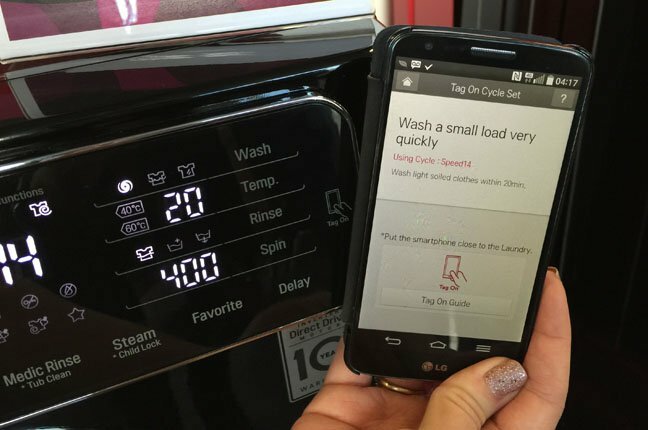 It features NFC to make connecting simpler and features an app for iOS and Android that, among other things, expands the number of washing cycles available from the machine’s default of 14 to 22. Why anyone would ever want 22 different wash cycles or more is another matter. Samsung goes one better with the WW9000, which is three times the price, but more on this later. Talking of Samsung, it acquired the SmartThings open platform in 2014 to deliver an ecosystem that would allow appliances across its range – from AV to white goods – to actively connect to each other and be configurable via one app. SmartThings works with wireless standards including ZigBee, Z-Wave and Wi-Fi with the potential to connect to numerous devices from a hub and cloud platform. Yale, the lock specialist and technology giant Honeywell – also a veteran manufacturer of thermostats and heating controllers – have also joined SmartThings.